This is what we were talking about. We neither have to go hungry nor walk bare feet by giving something to the poor. We have a lot of used and unused clothes that may not have any use to us, but to someone out there it would mean so much. And heeding to the call of needy is our innovative people behind ShoeVival. 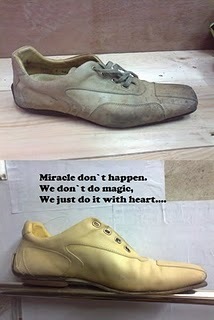 And they plan to distribute these refurnished shoes to the poor people in the villages. I am really impressed by their kind gesture and understanding of the plight of the poor lot. This initiative would also go a long way in cultivating a sense of giving in Bhutanese. Everyone can be a part of this campaign. Just donate a pair or two used shoes. The Thimphu campaign starts from 10:AM onwards. Although I regret for being unable to be physically present during the campaign in Thimphu, I am sure going to contribute something to the project as it goes out elsewhere in the country. We have all our support. Well that’s really a great job.. In deed the students of college of Science and Technology in Phuntsholing, have a club named Kuenphen Tshogpa where they do collect shoes and cloths (be it pant, shirt, bed sheet, pillows etc...) and reach out for the poor in remote communities. These are something very impressive and noble. Thank god now such practice is hitting the capital too.. Great to hear.. Thanks for updating. I always had a nice time going through your blog.. Keep posting la.. Thanks Dorji for finding time to go through. You are right. We have so much to learn from these inspiring initiatives and the people behind them. Hope you are doing well now. surprised to know that someone is putting this cause on blog.. Well, I am the one behind this campaign.. I ll put some of my thoughts here.. Well, I always complain about lots of things around me till now. The environmental issue, waste issue, rich poor gaps, even the smallest problem like water, TV cable, sewage, etc.. But i noticed that by simply complaining isn't working.. So, this time around i thought to work upon it to expect a change.. Even though this will not change the whole situation but certainly pave a way forward for me and other concerned citizens..
Well, as a fact till now.. We have collected 2278 shoes on that single day.. I can put it in another terms, We have stalled 2278shoes going to landfill.. Thanks Lotey. And you are right the initiative is worth recording in the pages of our history. And thank you ShoeVival for your inspiring work done. It is people like you with innovative ideas who can take our country forward. It was so thoughtful of you and we are always there to render possible in this cause. I request you to make it an ongoing cause. And I hope some companies in the country support your noble cause. But for now, job well done. We are all very proud of your work. Keep going man.